As I was getting the new work shop organized I discovered that my old Zenith AM/FM vacuum tube radio wasn’t working properly. When the tubes warmed up it emitted a 60 cycle hum from the speaker, which is usually a sign of a bad filter capacitor. A filter capacitor is used in conjunction with a rectifier to convert AC voltage to DC voltage. I needed to get inside the radio and start testing capacitors and this was a good reason to use my newly acquired vintage capacitor checker with a “magic eye” tube! The back of the radio was easy enough to remove because it just presses in with no screws. Of course, I made sure it was unplugged from power before opening it up even though the power cord has a built in interlock so that when the back is removed, the power cord disconnects from the chassis and stays with the back. This was a safety precaution employed by many electronics devices that were intended to be repaired when something inside failed, quite unlike today’s devices that get thrown away. Once inside I found the main filter cap and tested it. It was OK so I moved on to another possible cause which is corrosion of the tube pins and sockets. I connected a temporary power cord to the chassis for testing while the back was off. Being very careful to NOT touch anything inside directly with my hands while it was on, I used a long screw driver that I held by the plastic handle and lightly tapped the top of each tube. One of them made a “staticy” noise which meant it had a poor connection in it’s socket. I turned the radio off, disconnected power and set about cleaning the tube pins. I pulled each tube one at a time and used some fine sandpaper to clean the pins, then inserted and removed the tube back in it’s socket a few times to help remove any corrosion from the socket. A good rule of thumb here when working on older tube electronics. The capacitors can hold a lethal charge. If you have both hands inside the unit and accidentally touch both leads, the current can potentially pass through your body and stop your heart! You can discharge the capacitors by placing a 100 K ohm 5 watt resistor across the leads. As another precaution, never reach inside a device with two hands. Always keep one hand behind you. I learned this from a Ham radio mentor as a kid. It’s just good practice when working on electronics. Once the tubes had been cleaned I powered the radio up and it worked fine again! You can watch the whole process in the video below. I love the sound of a tube radio and it’s nice to have on while I’m working in the shop. 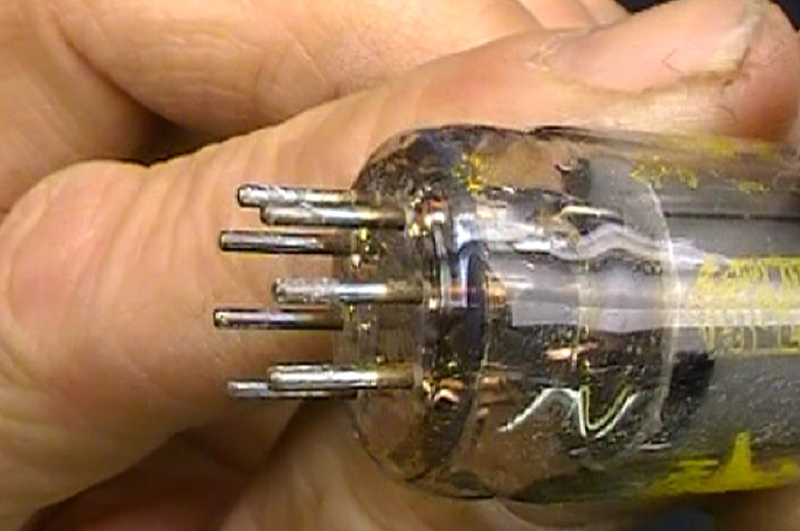 Vacuum tubes have a nice warm sound and in the video you’ll find out why as I give a brief explanation of how they work based on “Thermionic Emission”. If you decide to repair an old radio, you do so at your own risk. BE CAREFUL OF THOSE CHARGED CAPACITORS! So what was the final problem?